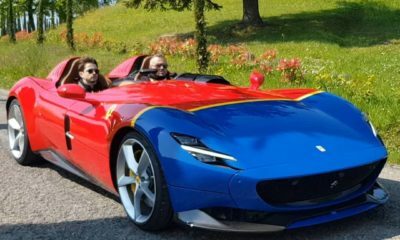 A total of three LaFerraris were damaged during Ferrari Cavalcade 2016. Ferrari owners and collectors from all over the world descend upon Italy for the annual event each year. The aim is to drive down some of the greatest Italian roads in exotics and just have some fun on the way. This year, things didn’t go well for a couple of LaFerrari owners. The owner of one of the supercars posted a few pictures on his Instagram revealing the damage caused by another LaFerrari hitting his car from behind. Not once, but twice. Apparently, the driver sneezed which caused him to lose control and hit the car in front. In a separate incident, a LaFerrari plowed into a parking lot and hit a white Lancia Epsilon. The damage on it seems quite substantial from the images posted here. The unique red and black LaFerrari was earlier spotted in London. Now though, it seems it will be spending some time in the repair shop.